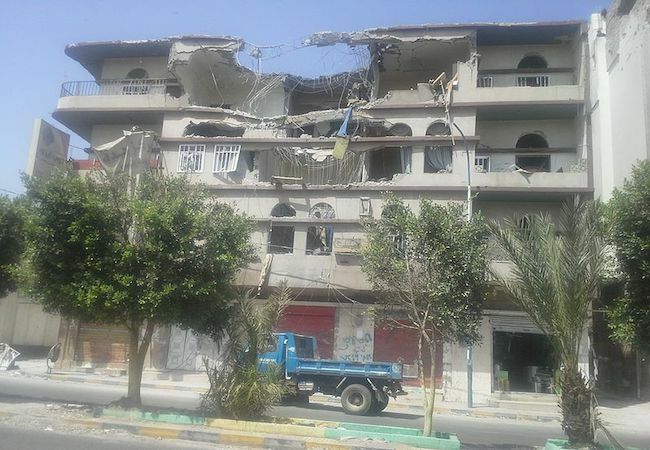 Apartment building destroyed in 5 September 2015 in Sana’a. 29 Jun 2018 – A 27 June 2018 meeting of United Nations Secretariat and government experts on Yemen from a number of countries in Paris again called attention to the deep humanitarian crisis in Yemen as Saudi coalition forces attacked the port city of Hadeida into which normally comes over 70 per cent of food and medical supplies of the UN and non*governmental relief agencies for the Yemeni population. The port is currently closed due to the fighting, and many of the humanitarian organizations have pulled out their staff for their safety. The Yemen conflict can become even more complicated. Iran has just sent two war ships, a helicopter carrier and a destroyer, toward the area. It is not enough to lift the Saudi blockade, but war ships have a habit of inviting trouble. Saleh, however, never really accepted the idea of giving up power and its material benefits. He formed an alliance with a religious movement that drew its members from the same geographic region. Saleh had combated this Huthi movement, including by force of arms, when he was president. But for a time the alliance seemed to be mutually beneficial. The alliance broke sharply this November. 2017. Fighting among the Huthi forces and those loyal to Saleh broke out in the capital Sana’a in November and on 4 December, Huthi troops shot Saleh in his auto as he was trying to leave the city. Today, the choice between an end to the armed conflict with negotiations for a renewal of a Yemeni State on the basis of the con-federal system proposed and continued fighting in the hope that one faction become a “winner-take-all” is relatively clear. The Association of World Citizens is resolutely for an end to the armed conflict with serious negotiations on the structure of a future State.